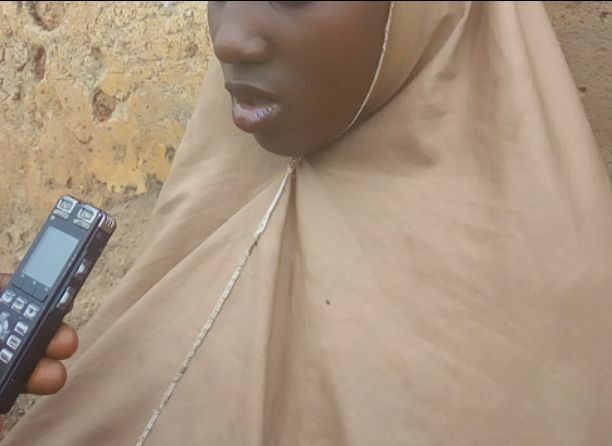 Call it a pathetic and hopeless situation and you may not be too far from the reality life has presented to this 13-year-old twin daughter of late Mallam Musa, Hussaina. She needs help and willing to go back to school after she dropped out of school at primary 3. When Hussaina and her twin brother Hussein came as first children of their parents 13 years ago, then, they were source of joy not only to the immediate family members, but to the entire Sabon Gaya, a community that hosts permanent orientation camp of National Youth Service Corps (NYSC), Chikun local government area of Kaduna State less than 20 minutes drive from Kaduna, the State capital. No thanks to death! Before Hussaina father died, he had four other children from the same woman making them six together with Hussaina and her twin brother Hussein as eldest. But the 28-year-old mother is finding it so difficult to feed these children let alone of sending them to school because she is not having any sustainable economic livelihood she and her children can depend on for survival. She did not have any former education and got married to her late husband when she was 15 years old. She want her children to go school so they don’t end up becoming indicicive and poor. Now in order for her and her six children to survive the hash economic situation in the country, she thought marry again would help her situation. And the mother of six remarried again. But instead of her situation and that of her children she had for her late husband to improve in her newly found haven, the opposite is the case as the ‘new man’ told her point blank that he was not interested in the upkeep of those six children which eventually led to Hussaina’s drop out. Let listen to Hussaina as she and her mother weep profusely while telling her story…. “My name is Hussaina Musa. I am 13 years old. I live here with my mother and my younger ones. I left school not quite long because I could not afford the expenses it involved any further. I was in primary 3 when I stopped going. “I want to go back to school but there is no power. If I have the opportunity, I want to return to school to continue with my friends and become a big woman in future so I can help others in my category and those who don’t understand the importance of going to school. “This is happening to us because our father is no more and my mother alone cannot help the situation. I’m begging anyone that can help me get back to school. No, marriage is not on my mind but I hope and pray Allah guide me and my younger ones to bear the struggle”, she yelled. Hers is one of everal other you will say. Some of the challenges posing serious threat to survival of girl child education include but may not limited to harmful cultural practices, religion, poverty, security, preferential treatment, inadequate and lack of schools within reach among others. Gobroadsheet got to know when the team visited Sabon Gaya community for the on the spot assessment of Christian Aid Nigeria (CAID_ Nigeria) project called Collective Action for Adolescent Girls Initiative (CAAGI) in Kaduna. CAAGI is a CAID_Nigeria funded programme among others aiming at improving the choices and opportunities available for adolescent girls in Kaduna State. Earlier, traditional and religious leaders in Sabon Gaya said they were happy with the intervention by CAID_Nigeria as they have done a lot of sensitization on importance of girl child education and they are now fully involved in the campaign at their locality.